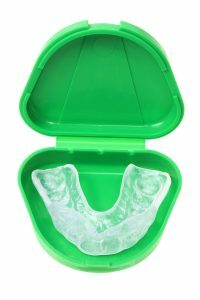 Your mouthguard case keeps it safe, so use it! Whether you have a mouthguard for sports or as a solution for teeth grinding, you want it to last for years. That is possible with regular cleaning and proper care. Your mouthguard can be brushed, just like your teeth, with a regular toothbrush, after every use. It can also be rinsed (but not soaked) with mouthwash, or washed and rinsed with soapy water, hydrogen peroxide, a mild bleach solution and even dental cleaners designed for dentures. The key is to use these solutions to wash it, but never soak it for extended periods, as this can damage the plastic material. Always finish every mouthguard cleaning by rinsing in regular water. When you receive your custom mouthguard from the Placerville Dental Group, it comes with its own carrying case. This should be used to store it in, as well as to travel with it. The carrier will protect it from unintended damage. Keep it out of direct sunlight, and away from heat sources and curious pets! Sunlight will cause it to decay, heat will deform it and pets will destroy it. The benefits of your mouthguard are apparent once you start using it, and good care ensures years of satisfaction and healthy teeth. Direct any questions you may have about the care of your mouthguard, nightguard or “biteguard” to our knowledgeable staff at the Placerville dental office.